TDD is a set of rules for writing code: you write a failing test (red), then add just enough code to make it pass (green) and finally refactor where necessary (refactor). In this chapter, we discuss how to set up testing for your project using Mocha, how to do dependency injection for your CommonJS modules, and how you can test asynchronous code. The rest is best covered by some other book or tutorial; so if you haven't heard of TDD, get out from under that rock you've been living under and read Kent Beck's book and perhaps Michael Feather's book. Test driven development is not valuable because it catches errors, but because it changes the way you think about interfaces between modules. Writing tests before you write code influences how you think about the public interface of your modules and their coupling, it provides a safety net for performing refactoring and it documents the expected behavior of the system. In most cases, you don't completely understand the system when you start writing it. Writing something once produces just a rough draft. You want to be able to improve the code while ensuring that existing code does not break. That's what tests are for: they tell you what expectations you need to fulfill while refactoring. 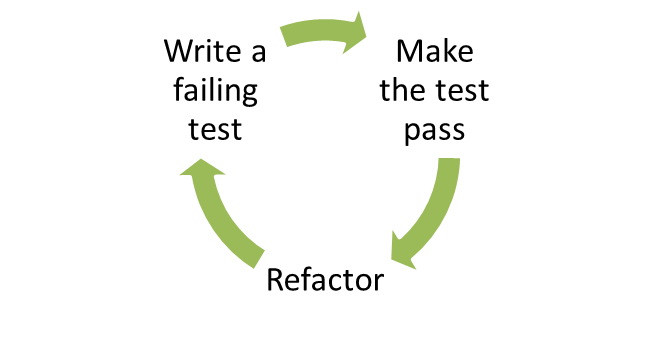 Test driven development implies that tests should guide the development. I often use tests as TODO's when developing new functionality; no code is written until I know how the code should look like in the test. Tests are a contract: this is what this particular module needs to provide externally. I find that the greatest value comes from testing pure logic and otherwise-hard-to-replicate edge cases. I tend not to test internal details (where you test the actual implementation rather than the public interface). I also avoid testing things that are hard to set up for testing; testing is a tool, not a goal in itself. This is why it is important to have good modularization and few dependencies: the easier your code is to test, the more likely it is that someone will want to write tests for it. For views, I'd test the logic (easy to test/easy to have errors in) and try to make it so that it can be tested separately from any visual properties (hard to test without a human looking at stuff). Use any test framework/runner except Jasmine, which is terrible for asynchronous testing due to the amount of boilerplate code it requires. I like TJ's Mocha, which has a lot of awesome features, such as support for all three specification styles, support for running tests in the browser, code coverage, Growl integration, documentation generation, airplane mode and a nyan cat test reporter. I like to use the "exports" style - it is the simplest thing that works. Some frameworks require you to use their assert() methods, Mocha doesn't. I use Node's built-in assert module for writing my assertions. I'm not a fan of the "assertions-written-out-as-sentences" -style; plain asserts are more readable to me since they translate trivially to actual code and it's not like some non-coder is going to go poke around in your test suite. Note the use of the done() function there. You need to call this function at the end of your test to notify the test runner that the test is done. This makes async testing easy, since you can just make that call at the end of your async calls (rather than having a polling mechanism, like Jasmine does). Check out the assert module documentation for more. This way, people can run the tests using "make test". Note that the Makefile requires tabs for indentation. This makes running tests nice, since you no longer need to remember all those default options. Unit tests by definition should only test one module at a time. Each unit test excercises one part of the module under test. Some direct inputs (e.g. function parameters) are passed to the module. Once a value is returned, the assertions in the test verify the direct outputs of the test. However, more complex modules may use other modules: for example, in order to read from a database via function calls (indirect inputs) and write to a database (indirect outputs). You can capture the indirect outputs (dependency function calls etc.) and control the indirect inputs (e.g. the results returned from the dependency). You can simulate error conditions, such as timeouts and connection errors. You can avoid having to slow/hard to set up external dependencies, like databases and external APIs. This is known as dependency injection. The injected dependency (test double) pretends to implement the dependency, replacing it with one that is easier to control from the test. The code being tested is not aware that it is using a test double. For more complex cases, you want to replace the whole backend object. There are two main alternatives: constructor parameter and module substitution. Your code is more cluttered, since you now have to write this.backend.send instead of Persistence.send; you now also to pass in that option though you only need it for testing. You have to pass that option through any intermediate objects if you are not directly using this class. If you have a hierarchy where Server instantiates Channel which uses Persistence; and you want to capture Persistence calls in a test, then the Server will have accept at channelBackend option or to expose the Channel instance externally. Here, the _setBackend function is used to replace the (module-local) private variable Persistence with another (test) object. Since module requires are cached, that private closure and variable can be set for every call to the module, even when the module is required from multiple different files. Using this pattern you can inject a dependency on a per-module basis as needed. There are other techniques, including creating a factory class (which makes the common case more complex) and redefining require (e.g. using Node's VM API). But I prefer the techniques above. I actually had a more abstract way of doing this, but it turned out to be totally not worth it; _setBackend() is the simplest thing that works. Writing a workflow is the simplest case: you have a sequence of operations that need to happen, and in your test you set up callbacks (possibly by replacing some functions with callbacks). At the end of the callback chain, you call done(). You probably also want to add an assertion counter to verify that all the callbacks were triggered. If you use EE.once(), you have to manually reattach the handler in case of misses and manually count. If you use EE.on(), you have to manually detach at the end of the test, and you need to have more sophisticated counting. EE.when() works almost like EE.once(); it takes an event and a callback. The major difference is that the return value of the callback determines whether the callback is removed. Recording replacements (a.k.a spies and mocks) are used more frequently when it is not feasible to write a full replacement of the dependency, or when it is more convenient to collect output (e.g from operations that might happen in any order) and then assert that certain conditions are fulfilled. With the DOM or some other hard-to-mock dependency, we just substitute the function we're calling with another one (possibly via the dependency injection techniques mentioned earlier). Here, we are just replacing a function, capturing calls to it, and then calling the original function. Check out MDN on what arguments is, if you're not familiar with it.